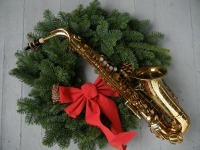 If your listening mood has shifted to Christmas, veteran jazz broadcaster Jim Wilke is ready to accommodate you. He has prepared a wide-ranging program by artists from his neck of the woods, the Pacific Northwest. Here’s Jim’s announcement about tomorrow’s program. Jazz musicians are often an unconventional lot, and when it comes to holiday music you can expect re-harmonizations, different tempos, unexpected rhythms and other surprises as they find new ways to play old music and old ways to play new music. This week’s Jazz Northwest provides ten explorations of familiar holiday music and some new music. Among the Northwest resident artists featured are Don Lanphere, Greta Matassa, Larry Fuller, Dave Frishberg, the B3 Kings and Karin Plato. Jazz Northwest airs Sundays at 2 PM Pacific Time and is recorded and produced exclusively for 88.5 KPLU by Jim Wilke. It is also streamed at kplu.org and is available as a podcast following the broadcast. Every year at this time I absolutely pull out my copy of Joe Williams’ That Holiday Feelin, my favorite jazz Christmas recording ever. It never gets old. If we are following in the Jim Wilke tradition and pointing to originality, imagination, pure fun and pure swing with holiday music, let’s not forget Rob McConnell and the Boss Brass and their Big Band Christmas, a 1998 Concord CD. It is vintage RMcCfun, very musical, wonderful to listen to, in the holiday spirit and very uplifting. And true to his mischievous ways, RMcC throws in such an amazing version of “My Favorite Things,” we don’t even notice that it’s not a holiday tune. Try to find this CD if you can…and pay extra if you need to. You will not be disappointed. I think, by the way, this was the last full Boss Brass recording in the RMcC catalogue. Ted O’Reilly will know!. I do indeed, Peter! One of the very best jazz/Christmas albums. Very respectful of the season and the music, but with McKonk’s sense of humour. Some things sound like a hip Sally Ann band! It amused Rob to be recording a Christmas record in April…. Sorry, I missed the reference to the Christmas record being the last BB recording… It was, indeed. Diminishing work for the band (with no lessening of the effort to keep it going) led him to downsize to a tentet. He wanted to make it like a loose little riff band, lots of solos and ad-lib backgrounds — like Basie in the late ’30s.